Brown Deer, Wis. - Freshman Madison Aranda set a school record and placed second in the 1,000-yard freestyle on the first night of the Horizon League Championships at the Walter Schroeder Aquatic Center on Wednesday. In the team standings, the Penguins had a solid opening day and are tied for second with 110 points with Milwaukee. Green Bay is in first with 114 points. UIC sits fourth at 101 points while Oakland is fifth at 96. Aranda's time of 10:05.10 easily eclipsed her previous best time of 10:28.05 which came back in October. Her teammate Viktoria Orosz set the school mark last month at 10:11.41. Milwaukee's Natalie Johnson won the event with a time of 9:59.80. The younger swimmers in the conference dominated the event with the top six being underclassmen. YSU set a school record in the 200-yard freestyle relay to start the night as Kolbrun Jonsdottir, Jana Janson, Aranda and Orosz posted a time of 1:35.09 to finish fifth. The old mark was 1:35.64 which came at last year's Horizon League meet. In the 200-yard medley relay, Ashley Dow, Hannah Reynolds, Rachel Shipp and Janson had sixth-place time of 1:44.70. That time ranked as the third-fastest 200 medley relay in school history. In the one-meter diving finals, freshman McKenzie Stelter was fifth with a score of 251.30 while sophomore Megan Siford placed eighth at 225.75. Earlier in the day, Stelter was third in the prelims (265.75) while Siford was eighth (229.95). Lydia Scheringer placed ninth with a 228.25 while Bethany Glick was 14th with a score of 219.20. 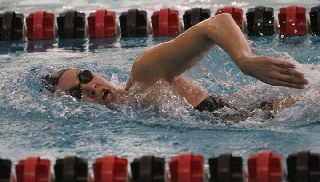 Sophomore Katrina Gerbrand swam a season-best time of 11:34.07 in the 1,000-yard freestyle in the morning session. The second day of the Horizon League Championships gets underway on Thursday morning with the 500-freestyle, 200-individual medley, 50-freestyle all on tap.